With advancement in dental implants, it is possible that just FOUR implants could replace your entire set of teeth in one jaw. All-On-4 dental implants are a fixed alternative to regular dentures. It helps you achieve a natural looking and feeling set of teeth which you don’t have to take out! This dental implant technique is recommended for those who have lost most of their teeth or those who want to replace their dentures with a FIXED set of teeth. How does All-On-4 dental implant procedure work? The All-On-4 concept dental implant treatment involves placement of 4 or more titanium implants in your jaw to create an anchor for a full dental bridge. Once the implants are placed a provisional bridge can be attached to your implants in one day! This is subject to suitability and individual assessment. Why is this such a great option? What makes All-On-4 such a great option is that you don’t need a separate dental implant for each and every missing tooth. 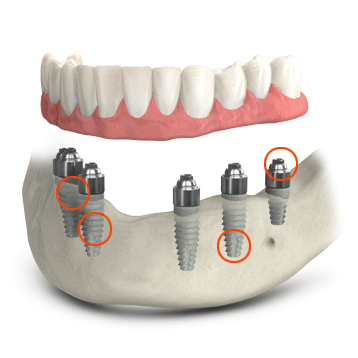 All-On-4 implant procedure places just 4 implants precisely on the top of your mouth and 4 at the bottom. More implants are recommended for patients with high risk such as a heavy bite or history of previous gum disease. These All-On-4 titanium implants get fused in to the bone. 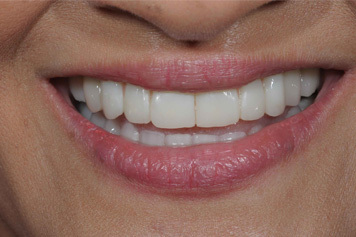 The dental implants then becomes a long-lasting and strong foundation for a new set of teeth. At our dental implant clinic in Melbourne, we have created a treatment model that revolves around the patient’s unique requirement. All on 4 is just one of the alternatives that we offer. Our goal is to make quality, ALL on 4 concept teeth replacement affordable to a wider community. Whether you need to replace a single tooth or multiple teeth, lower or upper arches, we are here to consult with you and help you decide what your best choice is.